Brighten up your Diwali with a stunning DIY Paper Lantern that brings not just light but lots of color into your life as well, this festive season! 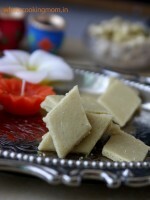 Diwali is just around the corner, and you know what that means – lots and lots of light all around! Diwali or Deepavali literally translates into the festival of lights and the way we celebrate it in India truly does this word justice! The lights you see in Diwali can be of any kind – earthenware diyas, tea lights, fairy lights, candles and decorative lanterns. Most homes usually use a mix of all kinds, and you can create some gorgeous combinations with them! 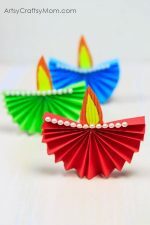 So this Diwali, we’ve got for you a stunning DIY Paper Lantern craft to make. And with all the colors and patterns going on, it’s not going to be just light that enters your home this festive season! 1. Trace or draw 4 equal sized rectangles on card stock. Leave a smaller 0.5 inch border at the top & bottom, and another at one side. Look at this template for reference. You can make it as big as you like! 2. Fold along the dotted lines shown and cut along the solid lines outside. Using an x-acto knife, cut out the rectangles in the center. This is better done by adults, since the knife can be dangerous and you need straight lines for the rectangles. 3. What you have now is the frame of your paper lantern with the front facing up. Turn it so that the back now faces you. 4. Cut out rectangles from thin tissue paper – make them slightly bigger than the empty rectangles we cut out earlier with the X-acto knife. 5. Paste these tissue paper rectangles over the corresponding empty spaces on the card stock. As for the color scheme, you can alternate colors, try ombre, or just go random! 6. Now turn the frame back up, with the front facing you. Looks lovely, doesn’t it! 7. Fold and secure all edges to form a paper lantern. 8. Decorate the edges with Washi tape. Go for glittery options for a festive feel. You can also embellish the lanterns with stickers or sequins. 9. Finally, weave a wire at the top so you can hang them. Fix a bulb inside and your lantern is ready! These lanterns can be hung indoors, outdoors or in the doorway. Though we love how it looks against the greenery of the garden! 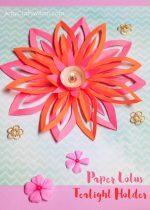 Make a bunch of these for a fun outdoor Diwali card party and watch your guests enjoy the beautiful glow of light all around! 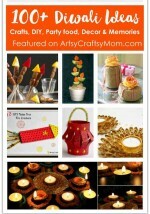 Don’t forget to check out these Diwali Crafts too!